Colonnade, an insurance company, moved this summer to Building A in the Gemini Business Centre in Pankrác. But the company's address wasn't the only thing that changed. 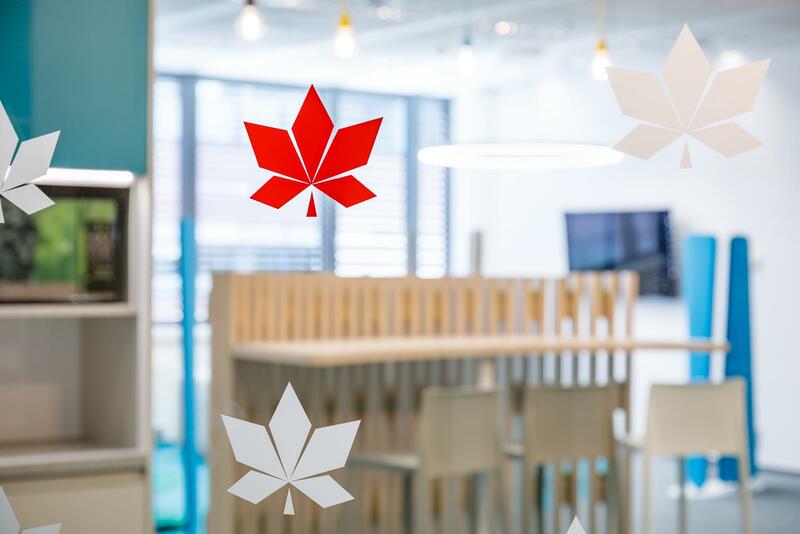 The design of the new offices was handled by our architect, Tereza Kondělková. 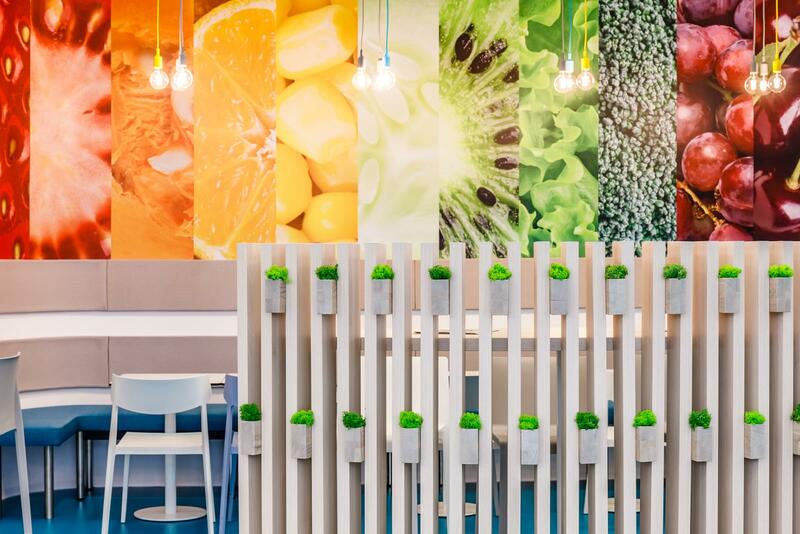 The goal was to design a colourful and attractive interior using matching materials, which meets the demands of clients in terms of the number of workstations while also offering employees a pleasant working environment. The client asked for a space containing sufficient storage areas, as well as acoustic elements to increase comfort. The client gave us a great deal of freedom and trust, so our architect's creativity was fully on display. The entire interior features distinctive colour shades and unusual shapes. The classical office space was thus transformed into an inspirational environment for work and more. The functional and practical purpose of the project was to include a sufficient amount of storage space and acoustic elements. These elements, together with plenty of greenery, form the cornerstone of the open space. 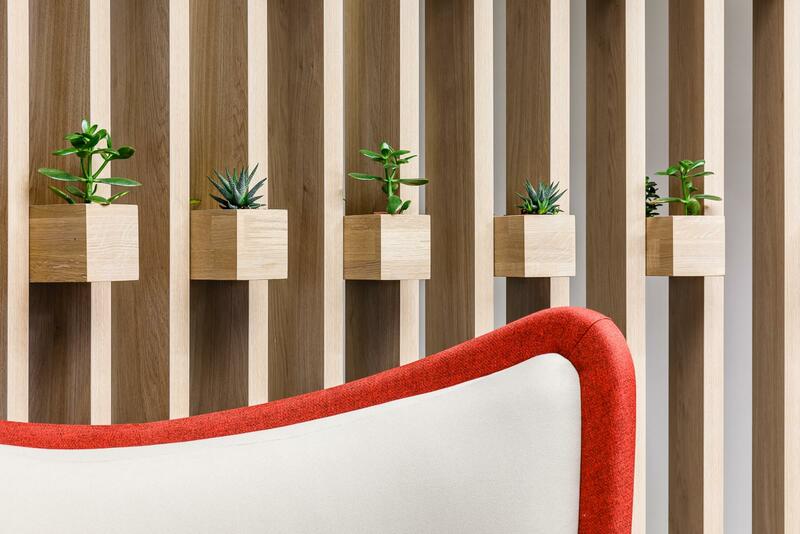 The café corner and the relax zone serve as a backdrop for relaxing moments or for interacting with colleagues. Due to today's focus on employee comfort, the relaxation area also features equipment for exercising during working hours, among other things wall bars, a stepper, a yoga mat, medicine balls, a putting green and a dartboard. Every day, a large number of employees and clients walk past the reception desk at the entrance area, which is why its appearance should be impressive. In addition, in the Colonnade this area separates the lobby intended for meetings with clients and the internal back-office part of the company. The desired effect was achieved by using wooden slats with greenery. Thanks to the woodwork used, the reception area is luxurious, modern, timeless and relaxed. The architect managed to distinguish the look of each department by means of an unusual solution involving the carpets, which are placed in the shape of waves. The basis is formed by a grey carpet that delineates the corridors and common spaces. 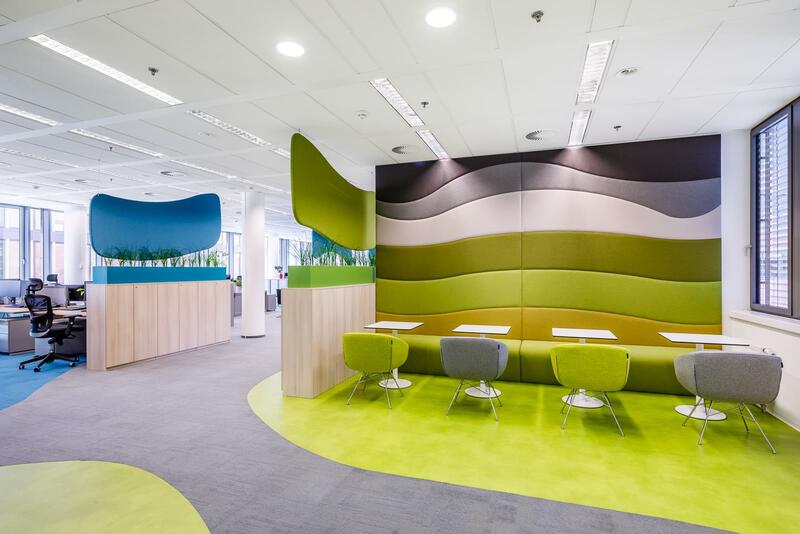 Each department is then defined by colourful carpets that flow out in waves from the basic grey carpet. These then travel to the reception area, where they are complemented by a circular carpet, whose dominance is accentuated by two Actiu Badminton armchairs. The carpet circle is then repeated in the open space suitable for shorter meetings. The furniture comes from the workshops of Actiu, Softline, Profim and Pedrali. The couches in the reception area were supplied by Longo, office chairs by Wing and desks by Tabula. The furnishings in the kitchenettes are provided by Actiu. 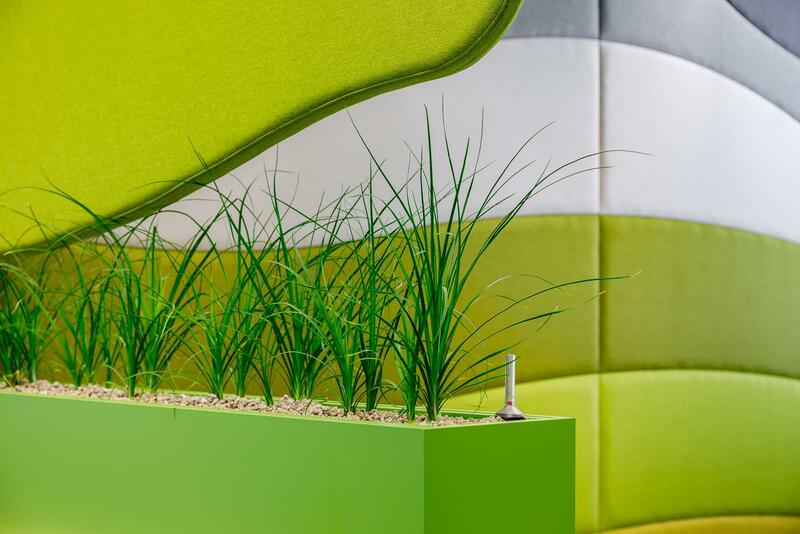 The Eurogarden carpets manufactured by Voxflor are designed in seven different colours and are supplemented in the reception area by vinyl from Tarket and in the kitchenettes by vinyl from Forbo. 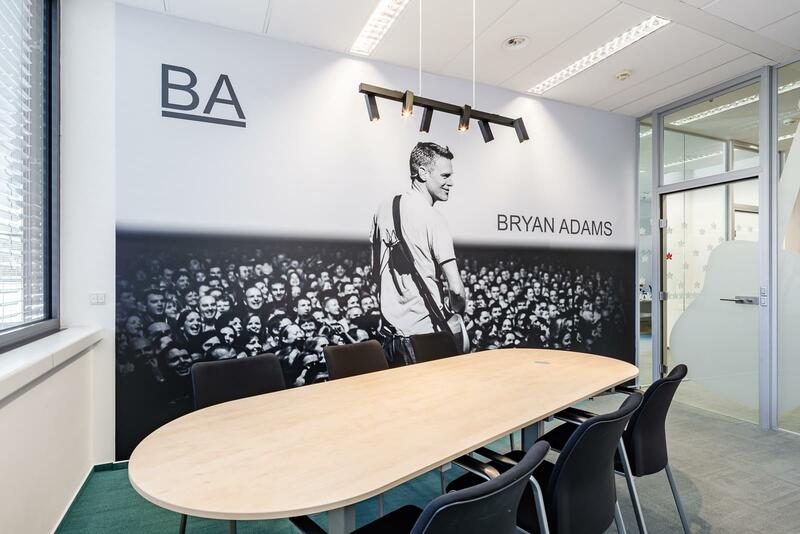 The meeting rooms have a playful quality thanks to thematic decorations depicting Canadian musicians Leonard Cohen, Bryan Adams, Avril Lavigne and Simple Plan. The decor reflects the company's origins. 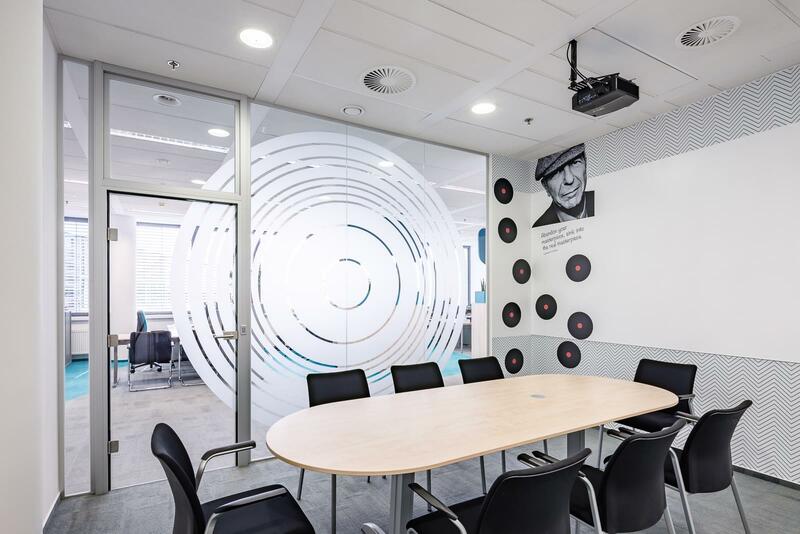 According to our architect, the colourfulness of the space and the integration of corporate identity was an important requirement of the client.